If you're reading this, it's likely you manage a large network, use multiple disks to store your data (termed RAID - Redundant Array of Inexpensive Disks) and are wondering why you're having issues. RAID systems are a proven entity (they've been around for years), they are cost effective and offer redundancy. That said, when things go wrong, entire companies (or divisions) can suddenly find themselves unable to access crucial data. The first question is what can be done to recover your data? The next one, how can I do it in a timely cost effective manner? We certainly don't wish disk failure on anyone, but statically speaking, most systems, RAID or otherwise, being mechanical devices will suffer failure at some point. When and if this happens, and particularly if the data is crucial to the successful running of your company, it's time to consult an expert like RAID data recovery Birmingham. Preferable the company you choose will offer..
We realize that your company data is crucial, paramount to the bottom line and must be online 24/7. It is with that thought you should call us, or fill out the contact form and let us lay your RAID data loss fears to rest. FACT: As technology improves, disks become more reliable, but still can fail. Studies show that over 3% of drives fail in the first 3 years of life and percentages rise from that point forward. What are some of the problems associated with RAID data issues? Controller failure - Being mechanical a RAID controller can fail due to power surges and other issues. This can cause issues on boot-up and diminish (or halt) the system for proper operation. Partitions that are missing - like any hard drive/disc, partitions can become corrupted or unreadable. Rebuild failure - RAID volumes must be rebuilt correctly, a failure here could cause a system wide breakdown, certainly problems accessing data. Multiple disc failures - While RAID represents redundancy, if a disk fails, additional stress (statistical speaking) is placed on the remaining drives. Continued use in this state could conceivably cause the array to fail. Server crash - A server crash would obviously render an array inaccessible. 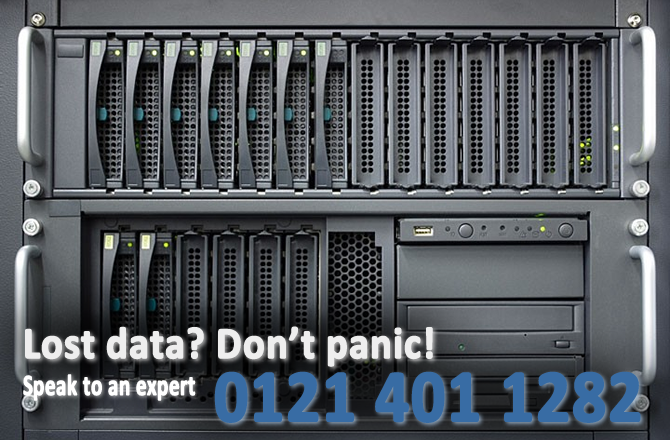 RAID data recovery Birmingham is manned by a skilled team of techs who collectively have 30+ years of experience in data recovery. Our team isn't simply tech savvy, they're also driven to succeed, treating each job as a goal they much successfully reach before moving forward. With skills in Windows, Mac, Linux, Solaris, BSD or other Unix variants you'll not easily find a team more qualified to navigate your dilemma. You aren't an order number to us; you're an individual with an important issue, one we can help with. Need a 24 hour turnaround? We're ready and able. Need on-site repairs? Our team is primed and ready for travel. To others data may be ones and zeroes, to us it is the very fabric of the net, we deliver results, let us prove it. We understand the stress you may be feeling, it's likely one or more of our tech team has stood exactly where you are now, wondering, "how can I get this back online quickly". We can help, not simply by understanding what you're going through, but by delivering on promises, both with technical prowess and excellent customer service. It doesn't matter if you're running Linux, Redhat, Windows, Ubuntu or any other system; we've likely worked on it and can offer experienced suggestions and competitive pricing. We're sorry you're having issues, but we do want your business and we're willing to "go the extra mile" to prove our willingness. None of this is said to tout our egos, simply to let you know we're qualified and eager to perform a bit of "RAID data recovery magic". If you're in the middle of a data loss crisis, we're ready to jump in the fray and help make any data loss crisis vanish. That's our job, and we've built our company and stake our reputation on it every day. Give us a call toll-free or fill out our contact form, we're here, ready and willing to serve.